Facilitates fast revolving working capital requirements and regular transactional needs. The facility is structured working capital financing for building inventories for seasonal sales. The facility is provided on the basis of anticipated cash conversion cycles, normally the tenure of the loan is 90 to 180 days. Nepal is an import based economy. Most of the raw materials for manufacturing are import based. Trust Receipt Loans are easier and popular to finance imports through Letters of Credit facility for trading and manufacturing houses. Such loans are provided for maximum of 120 days of documents retirements. 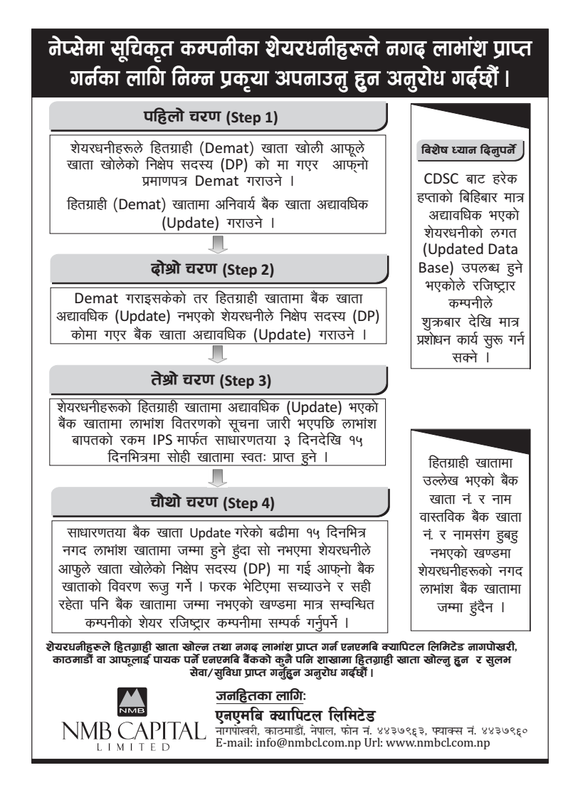 Importers loans are provided for imports under payment mode of TT, Demand Drafts and DAP facility. The product facilitates financing needs of the exporters. The loan is provided against the Export LCs or Confirmed Orders for delivering export commitments. Short term loans based on export realization cycle are provided for acquiring raw materials, financing overheads, packaging of finished products and other costs prior the goods are shipped. The loan is provided for maximum of 70% of the total needs. NMB Bank has over 10 years of experience advising and arranging financing for major projects in Hospitals, Hydropower, Mmanufacturing, Real Estate & Hotels throughout Nepal. 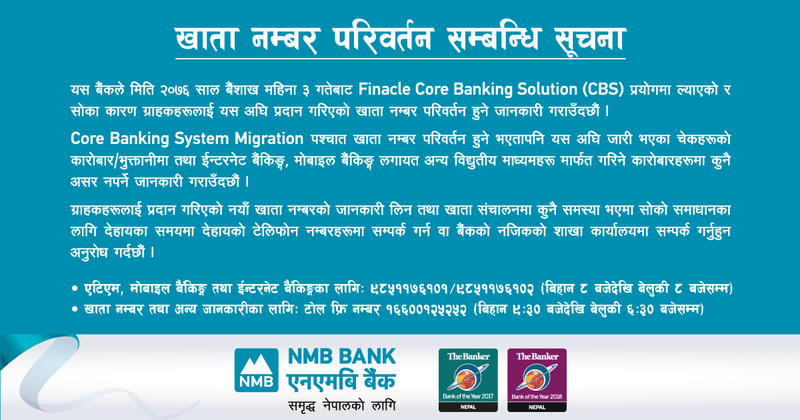 The bank is known for its outstanding track record and long-standing commitment to the project finance market of Nepal. Our team draws on the expertise of product teams and sector specialists across the full capability of NMB Bank where necessary, to ensure our solutions are fit-for-purpose and appropriate to client needs. The Project Finance Group has institutionalized capabilities to successfully manage the unique and multidimensional process of project finance transactions led by customized project structuring approach. With the experienced team in commercial banking, we are equipped to lead large size projects under consortium\syndication arrangements. NMB Bank is providing optimum solutions to its clients with an appropriate decision support for strategic measures in future. NMB Bank provides expertise and services to clients for each stage of project development, including financial advisory, structuring and arranging, coordination and syndication, and post-financial close. 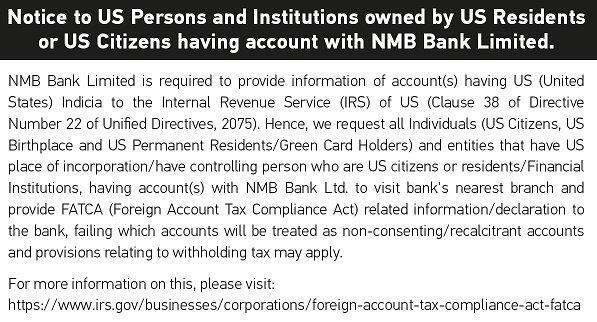 NMB Bank provides Term Financing based on the project feasibilities for long term projects that generate cash flows over a period of time. The financing is normally available for 70% of the total requirement with flexible tenure of 3 to 13 years as per the project needs and cash flows forecasts. Terms could vary depending upon the project feasibilities. NMB Bank has successful experiences in facilitating long term projects like hospitals, hydropower, manufacturing, real estate, hotels, etc under syndication arrangements with consortium of banks. With the experienced team in commercial banking, we are equipped to lead large size projects under consortiumsyndication arrangements.